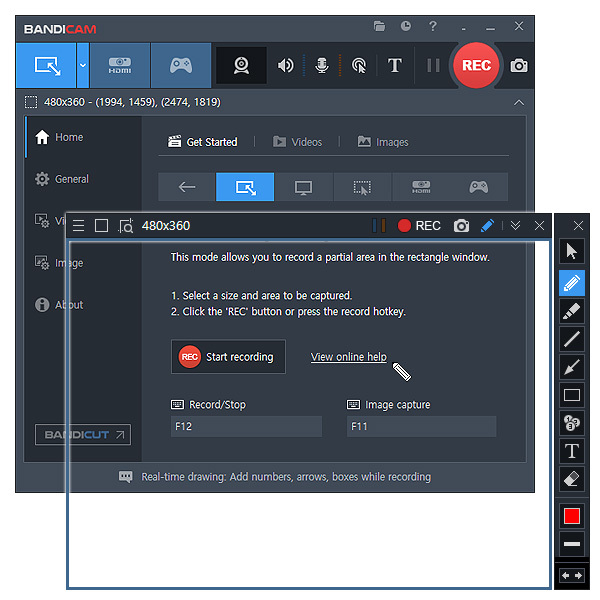 Bandicam will help you carry out a game capture with high compression ratio, while keeping the video quality closer to the original work, and provides performance far superior to other screen capture software that provide similar functions. Bandicam compresses the video while recording and uses less CPU/GPU/RAM resources, and it fully supports the hardware accelerated h.264 encoder of Nvidia NVENC/CUDA, Intel Quick Sync video and AMD VCE which allow video to be recorded in high speed, with a high compression ratio and excellent quality. As a result, it has less lag and you can save your HDD and CPU. Bandicam displays FPS number in the corner of the screen while it is active in Game Recording Mode. It also can record video at resolutions of up to 3840×2160 in high quality and your webcam will be simultaneously recorded and merged with the game / screen recording. In addition, Bandicam supports mouse click effects and a real-time drawing function which allows users to draw lines, boxes, or highlights while recording the computer screen. You can upload the recorded file to YouTube without converting it because the recorded file size is much smaller than files created with other software. Bandicam supports AVI 2.0, the maximum file size is unlimited as long as the local Hard Disk has free space available(Over 24 hours recording is possible). Furthermore, Bandicam can simply remove a background of a webcam and make a chroma key video in real-time while recording. When the Chroma Key and webcam overlay function are used in conjunction with microphone recording, Bandicam has become the ideal screen recorder for making video tutorials or let’s play videos.